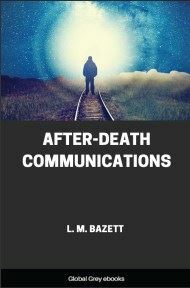 This book deals not only with the issue of the physical versus the metaphysical, but also considers the problem of death and the afterlife, and the question of communication with the spirit world. 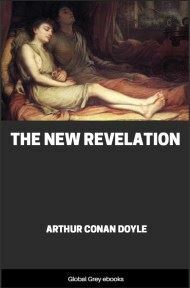 Conan Doyle's 'The New Revelation' makes for an enlightening exploration of some eternally relevant questions, and possible answers. The subject of psychical research is one upon which I have thought more and about which I have been slower to form my opinion, than upon any other subject whatever. Every now and then as one jogs along through life some small incident happens which very forcibly brings home the fact that time passes and that first youth and then middle age are slipping away. Such a one occurred the other day. There is a column in that excellent little paper, Light, which is devoted to what was recorded on the corresponding date a generation—that is thirty years—ago. 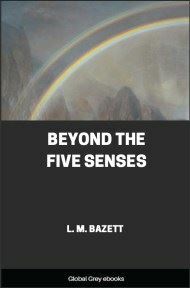 As I read over this column recently I had quite a start as I saw my own name, and read the reprint of a letter which I had written in 1887, detailing some interesting spiritual experience which had occurred in a seance. Thus it is manifest that my interest in the subject is of some standing, and also, since it is only within the last year or two that I have finally declared myself to be satisfied with the evidence, that I have not been hasty in forming my opinion. If I set down some of my experiences and difficulties my readers will not, I hope, think it egotistical upon my part, but will realise that it is the most graphic way in which to sketch out the points which are likely to occur to any other inquirer. When I have passed over this ground, it will be possible to get on to something more general and impersonal in its nature. When I had finished my medical education in 1882, I found myself, like many young medical men, a convinced materialist as regards our personal destiny. I had never ceased to be an earnest theist, because it seemed to me that Napoleon's question to the atheistic professors on the starry night as he voyaged to Egypt: "Who was it, gentlemen, who made these stars?" has never been answered. To say that the Universe was made by immutable laws only put the question one degree further back as to who made the laws. I did not, of course, believe in an anthropomorphic God, but I believed then, as I believe now, in an intelligent Force behind all the operations of Nature—a force so infinitely complex and great that my finite brain could get no further than its existence. Right and wrong I saw also as great obvious facts which needed no divine revelation. But when it came to a question of our little personalities surviving death, it seemed to me that the whole analogy of Nature was against it. When the candle burns out the light disappears. When the electric cell is shattered the current stops. When the body dissolves there is an end of the matter. Each man in his egotism may feel that he ought to survive, but let him look, we will say, at the average loafer—of high or low degree—would anyone contend that there was any obvious reason why THAT personality should carry on? It seemed to be a delusion, and I was convinced that death did indeed end all, though I saw no reason why that should affect our duty towards humanity during our transitory existence. This was my frame of mind when Spiritual phenomena first came before my notice. I had always regarded the subject as the greatest nonsense upon earth, and I had read of the conviction of fraudulent mediums and wondered how any sane man could believe such things. I met some friends, however, who were interested in the matter, and I sat with them at some table-moving seances. We got connected messages. I am afraid the only result that they had on my mind was that I regarded these friends with some suspicion. They were long messages very often, spelled out by tilts, and it was quite impossible that they came by chance. Someone then, was moving the table. I thought it was they. They probably thought that I did it. 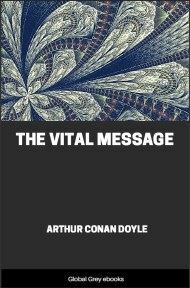 I was puzzled and worried over it, for they were not people whom I could imagine as cheating—and yet I could not see how the messages could come except by conscious pressure. About this time—it would be in 1886—I came across a book called The Reminiscences of Judge Edmunds. He was a judge of the U.S. High Courts and a man of high standing. 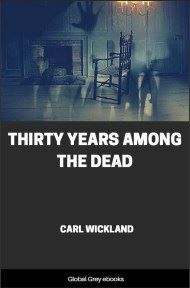 The book gave an account of how his wife had died, and how he had been able for many years to keep in touch with her. All sorts of details were given. I read the book with interest, and absolute scepticism. It seemed to me an example of how a hard practical man might have a weak side to his brain, a sort of reaction, as it were, against those plain facts of life with which he had to deal. Where was this spirit of which he talked? Suppose a man had an accident and cracked his skull; his whole character would change, and a high nature might become a low one. With alcohol or opium or many other drugs one could apparently quite change a man's spirit. The spirit then depended upon matter. These were the arguments which I used in those days. I did not realise that it was not the spirit that was changed in such cases, but the body through which the spirit worked, just as it would be no argument against the existence of a musician if you tampered with his violin so that only discordant notes could come through. I was sufficiently interested to continue to read such literature as came in my way. I was amazed to find what a number of great men—men whose names were to the fore in science—thoroughly believed that spirit was independent of matter and could survive it. 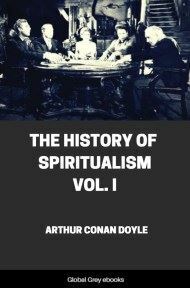 When I regarded Spiritualism as a vulgar delusion of the uneducated, I could afford to look down upon it; but when it was endorsed by men like Crookes, whom I knew to be the most rising British chemist, by Wallace, who was the rival of Darwin, and by Flammarion, the best known of astronomers, I could not afford to dismiss it. It was all very well to throw down the books of these men which contained their mature conclusions and careful investigations, and to say "Well, he has one weak spot in his brain," but a man has to be very self-satisfied if the day does not come when he wonders if the weak spot is not in his own brain. 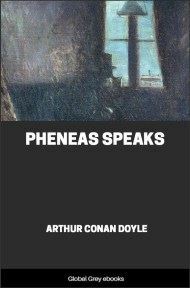 For some time I was sustained in my scepticism by the consideration that many famous men, such as Darwin himself, Huxley, Tyndall and Herbert Spencer, derided this new branch of knowledge; but when I learned that their derision had reached such a point that they would not even examine it, and that Spencer had declared in so many words that he had decided against it on a priori grounds, while Huxley had said that it did not interest him, I was bound to admit that, however great, they were in science, their action in this respect was most unscientific and dogmatic, while the action of those who studied the phenomena and tried to find out the laws that governed them, was following the true path which has given us all human advance and knowledge. So far I had got in my reasoning, so my sceptical position was not so solid as before.